BrakeSafe is an easy to use brake tester. VOSA-approved for MOT testing of all vehicle classes (excluding I & II), it is suitable for all cars, HGVs (including trailer testing), PSVs and other road-going vehicles. An ideal choice to monitor a fleets performance after servicing. 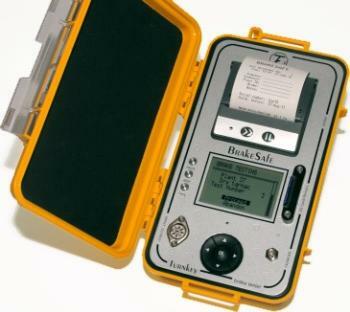 BrakeSafe measures peak and mean fully developed deceleration, and can be located anywhere in the vehicle, automatically aligning with the direction of travel. It does not need connecting to the vehicle, but may be used with a transducer to record pedal force and delay time. The instrument has pass/fail lights with a user-adjustable threshold, and records and prints test results. Test data is saved with date, time, vehicle & operator identity and more. These can be transferred directly to a PC, or transferred later from its SD memory card.